Marking a new chapter in the long-running Creatures series, Creatures: Village offers you another chance to let cute, cuddly, cheerful, and overall odd critters inhabit your computer. 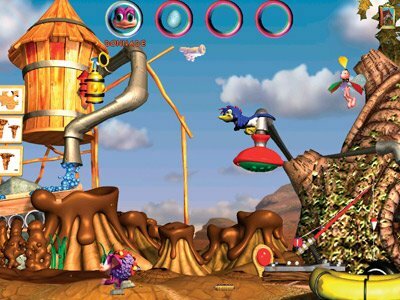 Targeted at a young audience, ages five and up, Creatures: Village does not have the gameplay depth and variety that will keep many adult players interested. However, the game might offer an interesting way to teach children the joys and frustrations of owning pets while keeping your house clean and allergies at bay. Creatures: Village is all about hatching, raising, teaching, and taking care of artificial life forms known as Norns. Designed to simulate real animals, Norns are capable of making decisions and learning on their own. 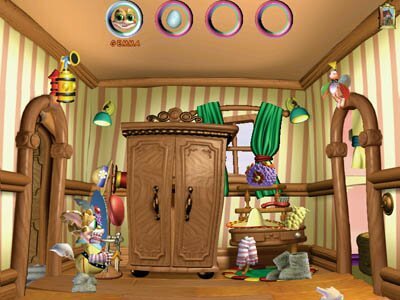 At the beginning of the game, players are given two eggs. Shortly after dropping the eggs in the bed that serves as the incubation area, the baby Norns hatch and begin their artificial lives. Initially, your baby Norns will have a very limited understanding of the world around them. As they explore different areas, Norns will discover how to respond to their essential needs. They may also figure out how to use some of the interactive objects in the village. Since Norn’s are independent, you will not be controlling them directly. In Creatures: Village, the player’s role is to serve as a guide. You will be helping Norns learn how to take care of themselves and play with the numerous toys scattered around the village. Player interaction with Norns is fairly simple and straightforward. Your presence in the village is represented by a glove that can be controlled with the mouse. Clicking on any part of the screen will beckon your Norns to go in that direction. You can also hold your Norns’ hands to guide them to different areas in the village. The Norns can learn how to use devices by observing your actions. If you try using an object several times around your Norn, eventually he or she might figure out how to use it as well. To further assist you with training your Norns, the game features two special items called Stickle and Jet. These items are always present at the top corners of the screen. The Stickle can be used to tickle your Norns. Since Norns enjoy being tickled, the Stickle serves as a form of positive reinforcement. If your Norns do something you would like them to repeat, you can click on the Stickle to reward them. The Jet on the other hand is used to punish your Norns by spraying them with water. While the Stickle and Jet are effective tools, their use will not result in complete control over your Norns’ behavior. The Norns are after all designed to behave like independent creatures. Training them is a process that will require some patience and repetition. The village that serves as the home of your Norns has a variety of locations you can visit. In each area, you and your Norns can interact with a number of objects. From a simple basketball to a weather-controlling machine, there is a wide variety of toys and devices to entertain your Norns. You can also have your Norns engage in activities such as flying an airplane made out of clouds or riding a cart through a haunted house. These activities often double as mini-games. For instance you can your Norns around the mountain area where they can ride a sled. Going down slope, you can maneuver the sled to dodge obstacles and gaining speed for a jump at the end of the trail. Completing such mini-games found throughout the game unlocks bonus items like additional toys or costumes for your Norns. Players are not limited to the two starter Norns in the villages they might create. Like real animals, Norns are able to reproduce. Upon reaching adulthood, provided that they like each other, male and female Norns can mate. There is of course nothing graphic about the mating; all you will hear is a kissing sound. If the female Norn does get pregnant, her stomach will grow and she will eventually lay an egg. Once the egg is transferred to the nesting area, it can be hatched and a new baby Norn will be born. The child will inherit “genes” from both parents and carry some of their characteristics. The game allows you to have a maximum of four Norns at any given time. Just like real pets, your Norns also do not live forever. Once they reach an old age, they eventually pass away. All Norns die peacefully and painlessly in their sleep. After they pass away, the Norns are transferred to the garden that serves as the graveyard in the game. Incorporating reproduction and death in Creatures: Village certainly makes the game a more realistic simulation. However, these features may also be key factors preventing some parents from buying the game. While Creatures: Village certainly does not feature the gruesome violence or blatant sexuality that is abundant in many video games, it can lead to difficult questions from your children. After all, not all parents will want to let their children be exposed to ideas of mortality and procreation at the age of five. 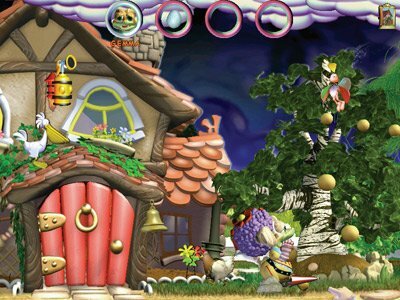 Creatures: Village also suffers from a considerable lack of gameplay depth. The manual boasts that each Norn comes with a unique Creatures Digital DNA*, suggesting physical and behavioral differences between each hatchling. Unfortunately, after playing the game for a few hours, you will find that the experience of raising a Norn does not change from one generation to the next. In addition, while the village does offer a diverse set of locations and a number of activities, there is most definitely room for more. It is very possible to explore the entire village and try out a large number of the available activities within the five-hour lifespan of your first two Norns. The various mini-games do not have the kind of appeal that will keep many players trying them over and over again either. Players of all ages might quickly run out of things to do and may not feel any desire to continue repeating essentially the same experience over generations of Norns. Creatures: Village could have benefited from a more finely-tuned interface as well. The game is simple enough to control since everything is done with the click of a mouse. However the interactive objects are not as responsive as they could be. In addition, the various toys and devices could have been better organized as many of the screens feel overly busy. Finally, traveling from one area of the village to another may become an unnecessary chore since there is no way to skip screens. You may end up dragging your Norns across multiple screens just to get them from one location to another. Even though the village is not all that big, a mini-map feature would have helped with the navigation immensely. Viewed as a whole, Creatures: Village can offer an entertaining experience for children and perhaps a relaxing one for older players. The game can certainly teach a thing or two about taking care of pets. However, with an interface that can be unresponsive at times, screens that can feel too cluttered, gameplay mechanics that can become repetitive, Creatures: Village is a difficult game to recommend. If you are looking for a simple game to spend a few hours, you might want to consider giving Creatures: Village a shot. If you are looking for a solid engaging simulation game, there are better titles out there. The final grade is 70/100. *This article originally appeared on Just Adventure.